Roseanna’s Reply begins six months after the attack on Pearl Harbor. The Japanese judged the attack a qualified success by sinking five American battleships. But they didn’t get any of the U.S. carriers (they were out to sea) and Admiral Yamamoto was afraid this would come back to haunt the Imperial Japanese Navy. He was right. There are those historians who have argued that, from a strategic standpoint, the Japanese really did the U.S. Navy little harm at Pearl Harbor. 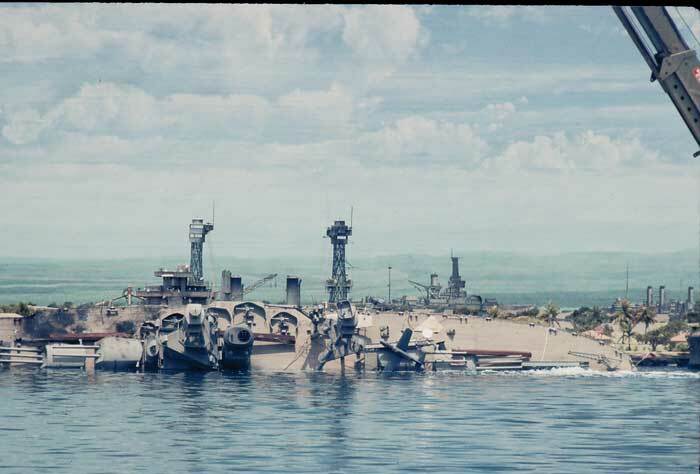 All of the battleships they disabled were of WWI vintage…worth little more than scrap iron in modern 1941 naval terms. Once again, the photo shown here might be a vintage Kodachrome from the day after the attack. But it is not. Obtained from a private collection, this is actually a photo taken in 1966 during the filming of the 20th Century Fox film Tora Tora Tora. At the Fox Studios movie ranch in Malibu, California, the company maintained an outdoor one-acre pond with a huge paintable backdrop twice the size of a drive-in movie screen. The sunken model seen here is actually about 20 feet long. In the upper left corner of the photo can be seen a portion of the crane arm that supported the movie camera.